love the concept of your blog- now i can read all the good parts without traipsing through all the dreary plots and re-introductions of all the characters in every novel. awesome! the only downside is now I feel dedicated to re-collecting every novel, just so I can BRING THE FASHION. Seriously, bsc style in general was just the highlight of every single one of those books. In hindsight, those girls wore so many leggings that they'd probably be fairly fashionable now, if it wasn't for their unfortunate and constant insistence on pairing them with 'huge oversized sweaters.' even ankle boots have made a comeback! Man, the bsc has it MADE in 2007.
this was my favorite outfit ever. the ms. frizzle reference was burned into my brain and when they made a magic school bus cartoon i couldn't help but think, 'the frizz don't have nothing on claudia!'. claudia's miss frizzle outfit was my favorite ever! Oh, my goodness, the Miss Frizzle outfit is what I always use as an example for how clumsily educational stuff is introduced into these books. 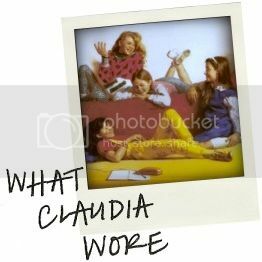 Also, as an example of Claudia's horrible taste in clothes, but people usually don't need to be convinced about that.